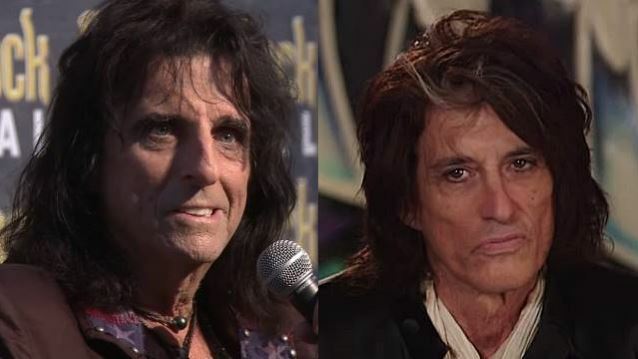 Legendary rocker Alice Cooper will play the Rock In Rio festival in Rio De Janeiro, Brazil this September under the HOLLYWOOD VAMPIRES banner with a band that includes AEROSMITH's Joe Perry and actor Johnny Depp. Although the exact date for HOLLYWOOD VAMPIRES' performance hasn't yet been announced, the band will make its debut on the same night as QUEENS OF THE STONE AGE and SYSTEM OF A DOWN are scheduled to appear. The sixth Brazilian edition of Rock In Rio will take place September 18-20 and September 24-27.
Cooper's covers album featuring songs that were originally written and recorded by THE DOORS, Jimi Hendrix, John Lennon and THE WHO — members of the so-called "Hollywood Vampires" of the early and mid-'70s — is tentatively due this fall. The CD will include "four or five new songs," which the legendary rocker wrote specifically for the new effort. He told VH1 Radio Network's Dave Basner: "We decided that in order to set up the 'Hollywood Vampires' thing, you had to kind of tell the story, and you had to write songs that were going to set up the story, and then get into the covers. So we had fun sitting there writing these new songs around it. So it's going to be quite a package, this thing is." Back in 2013, Cooper said about the upcoming CD: "We do a thing in our show, which is a tribute to 'Hollywood Vampires,' my drinking club. And it was Keith Moon, John Lennon, Harry Nilsson, Micky Dolenz — a very eclectic bunch of drunks. Half of them are dead, so we do four songs in the show in tribute to them. We do 'Break On Through', 'Revolution', 'My Generation' and Jimi Hendrix's 'Foxey Lady'. I just kind of said, 'We've never done a covers album, let's think about that.'"